10 Steps to Ensure Continuous Improvement - Something New Everyday! Well, This is my second episode on management consultancy. 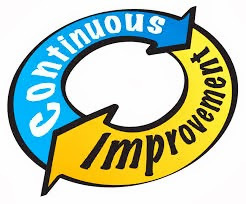 Ok, straight to the point, Continuous Improvement is an on-going effort in order to improve products, services or procedures of any organization. The effectiveness or efficiency enhancement can be in terms of cost optimization, better quality, improved customer satisfaction index, quick response time, fast production rate, reduced fault rate, Six Sigma Compliance, electricity conservation and several other domains. Continuous Improvement: Improvement at a linear rate. Continual Improvement: Improvement at gradual rate. 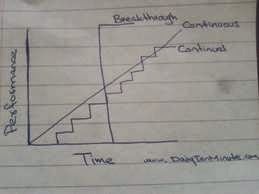 Breakthrough: A giant leap with major changes in a domain or several domains, sometimes executed only once. 1- Define current performance of Product, Services of Procedure(s). a. Consider Fishbone diagram, Cause Effect diagram. Perform analysis by doing breakdown of bigger problem into smaller problems. c. Seek advice from Managers, Field Employees, Stake holders, Subject Matter Experts. d. Consider customers' / End users' feedback about quality of products and services. 4- Make final list of options to execute. Consider associated risks with each execution. Consider Mitigation strategies for these risks. 5- Execute the options one by one on a small scale in a controlled environment based on risk mitigation strategies. 6- Prepare the observation register and list down the lessons learnt. 7- Review the observations with managers, senior management, SMEs (Subject Matter Experts) and stake holders. 8- Implement the change on large scale and set new standard.